As a military aviator Lt. Blow has logged more than 3,000 hours in six different aircraft. Lt. Blow arrived at Activities San Diego in August, 1994, following a four year assignment at Coast Guard Air Station Clearwater, Florida. She attended Army Warrant Officer Rotary Wing Aviation Course "WORWAC" or better known as flight school and was winged in February 1985. She served as Chief Warrant Officer Two and Aircraft Commander flying the U.S. Army's HH-60 "Blackhawk" Helicopter between 1985-1989. She was stationed in the Republic of Korea at Camp Humphreys 201st Combat Assault Company and Schofield Barracks, Hawaii 25th Infantry Division. From February of 1989 to June 1990 she flew in the Army Reserves. By October 1990 she was able to secure an aviation position in the U.S. Coast Guard. Due to her extensive military aviation background she received a direct commission in the Coast Guard during a four week course in Yorktown, Virginia. Since then she has been an Aircraft Commander in three Coast Guard helicopters: the HH-3F Pelican Helicopter, the HH-65A "Dolphin" and currently the HH-60J "Jayhawk". Lt. Blow has attended many military schools which significantly prepared her for to be an outstanding Flight Safety Officer. 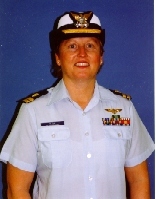 She has received many military medals and awards including: Humanitarian Service Medal, Army Commendation Medal, Army Achievement Medal, Commandant's Letter of Commendation with "O" device, Coast Guard Unit Commendation with "O" device, Coast Guard Bicentennial Unit Commendation, National Defense Ribbon, and Army Overseas Ribbon. Women's International Center takes great pride in presenting the 1998 Living Legacy Patriot Award to a native daughter and an exceptional member of the United States Coast Guard.